IHSA National Championship Horse Show in Syracuse to defend their title. 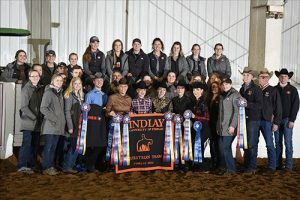 Fairfield, Conn—March 20, 2019—The Intercollegiate Horse Shows Association (IHSA) held its Western Semi-Finals, sponsored by the National Reining Horse Association (NRHA), March 16–17. Hosting the events were Florida State University (FSU) at the Florida Horse Park in Ocala, Florida, Utah State University (USU) at their facility at the USU Equine Center in Wellsville, Utah, and University of Findlay, at their facility in Findlay, Ohio. IHSA is celebrating its 40th anniversary of the Western divisions this year. 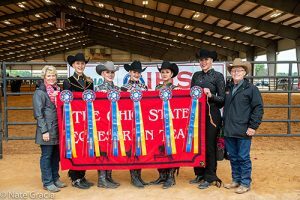 The Ohio State University, led by Debbie and Ollie Griffith, won the team competition at the Semi-Finals hosted by Florida State University. Photo by Nate Garcia. 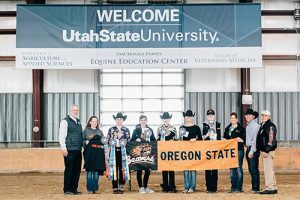 The Oregon State University team, coached by Dawn Ross, took the top prize at the Western Semi-Finals hosted by Utah State University. Photo by Lauren Anderson. Click here to see all Nationals-bound Western riders.